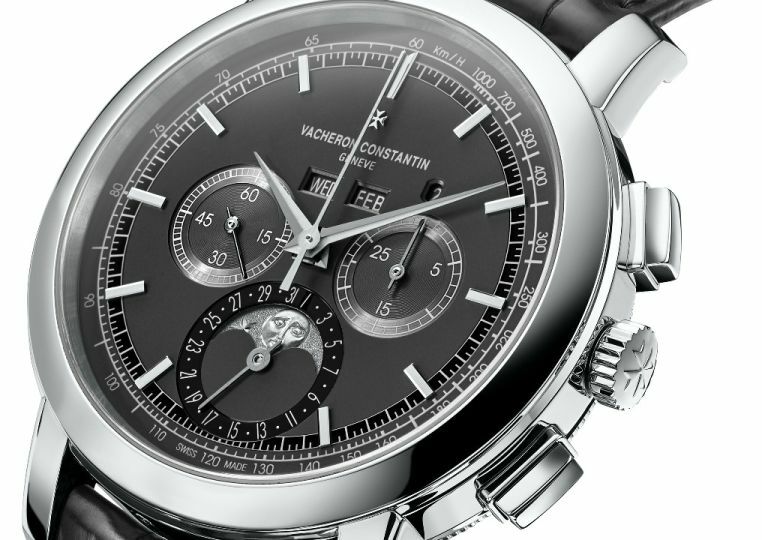 Vacheron Constantin introduced the face-lifted version its iconic model: The Traditionnelle chronograph perpetual calendar featuring the new in-house movement Vacheron Constantin Caliber 1142 QP. This new version of the Traditionelle Collection is offered in a platinum case which feels a bit bulky measuring 43mm x 12.9mm. The dial is simply beautiful. Besides the stunning moon phase disc made of 22K solid white gold, the dial features a metallic gray colored opaline base and 18K white gold hour markers and hands. The tachymeter scale is printed in white for better contrast. The day and month displays are located symmetrically under the 12 o’clock marker while the leap year indicator is placed over the sub-counter at 3 o’clock. Personally, I do not like busy dials... Especially the ones with multiple windows but, I am not bothered with that watch thanks to the day/date/leap year discs with blending dial color backgrounds. Let’s get to the best part: the movement. 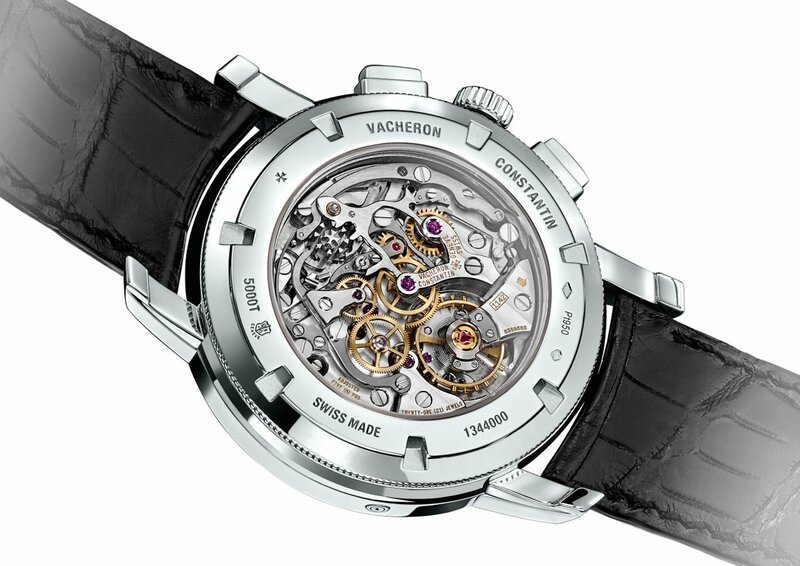 Caliber 1142 QP, a state-of-the-art movement entirely designed and developed within the Manufacture, replaces the previous 1141 QP. 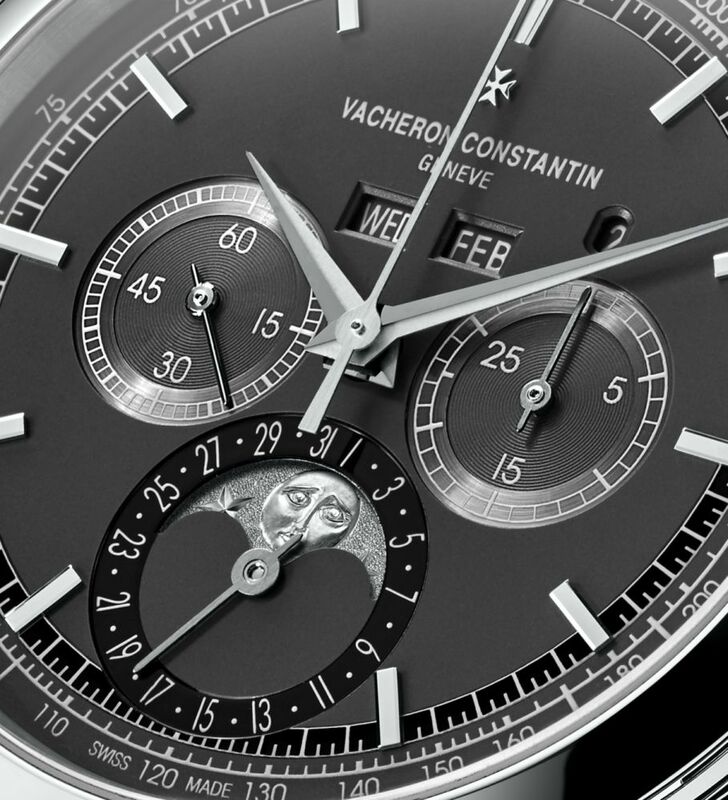 The new movement drives the perpetual calendar functions with indications of the date, days, months, leap years and moon phases as well as the chronograph functions with a direct-drive seconds hands and 30-minute counter at 3 o'clock, positioned opposite the small seconds at 9 o'clock. No need for adjustments until March 1st 2100. 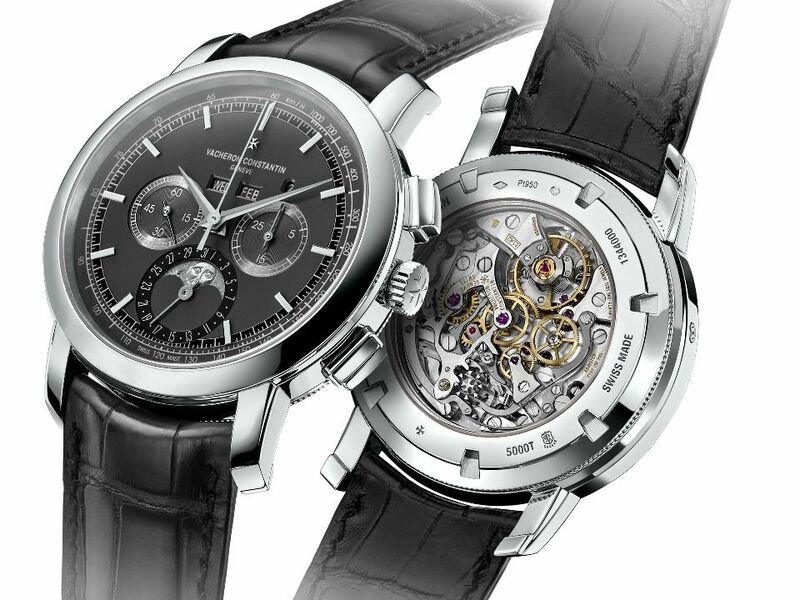 It is a manual winding movement with 21 jewels beating at 21,600vph and offering a power reserve of 48 hours when fully wound. The movement bears the Hallmark of Geneva and its functions are: hours, minutes, small seconds at 9 o'clock, perpetual calendar (day of the week, date, month, leap year indication), moonphase and column-wheel chronograph (30-minute counter) at 3 o'clock. There are some major upgrades over the predecessor Caliber 1141 QP. The oscillation frequency of the balance has also been raised from 2.5 to 3 Hz (21,600 vibrations per hour) in order to get increased reliability and improved shock resistance. With this new movement, the brand has been managed to reduce the impact of the features complications on the 48 hour power reserve as well. 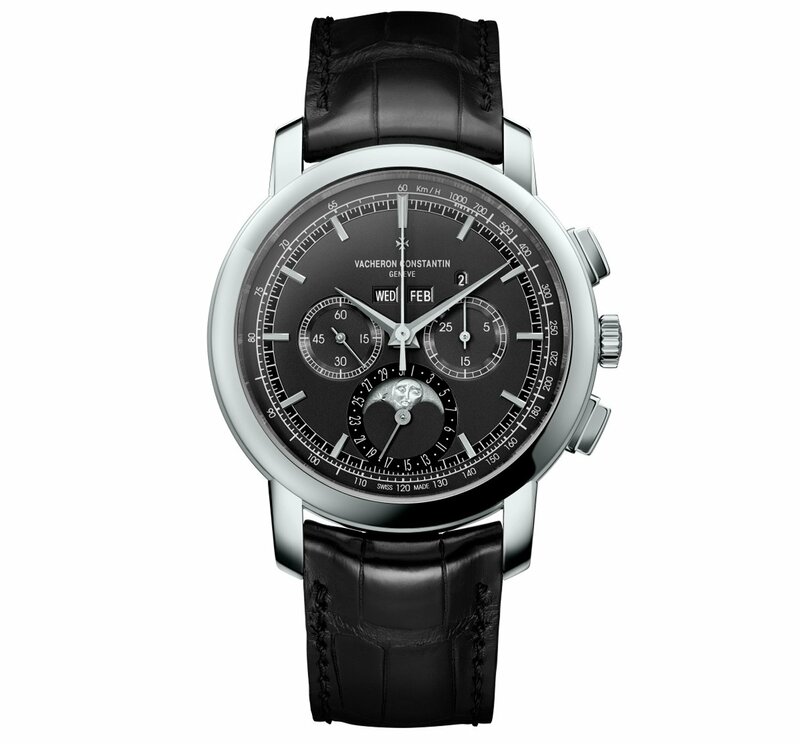 Vacheron Constantin Traditionnelle Chrono Perpetual Calendar is offered on a beautiful, hand stitched and saddle finished black Mississippiensis alligator leather strap. The strap is secured with a platinum folding clasp. The presentation box includes a watch winder and a corrector pen.